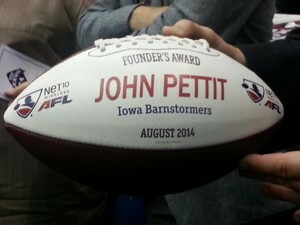 DES MOINES – The Iowa Barnstormers Vice President & Chief Operating Office John Pettit has been named the Founder’s Award recipient for 2014, the League announced at the ArenaBowl XXVII Awards Presentation on Thursday night. The Founder’s Award is presented annually to an individual or organization that has made significant contributions to the Arena Football League and its growth. Using years of executive level management and arena football experience, Pettit has continuously assisted in improving the Iowa Barnstormers franchise and the Arena Football League. In addition to leading the Iowa Barnstormers since their return in 2008, Pettit has held several AFL leadership roles as well as served on a variety of boards and committees. Other recent AFL honors received include Executive of the Year (2012) and the Commissioner’s Award (2013).